Use email gloryshouse@gmail.com as the referral email. It's Not to good to be true. Look what I received in the mail today! A check for 908.62! Here is how Mr. Rebates works. You simply sign up and they give you five dollars in your account just for signing up. When you get ready to purchase something online be sure to visit Mr. Rebates website first and type in the store you want to shop at. It may very well come up showing you the cash back you will get for shopping there. You then click on the shop now link from there and it takes you to the website to shop. For example, Walmart is 2% cash back. So I get 2 percent back on every thing I purchase from Walmart and it automatically goes in my Mr. Rebates account. 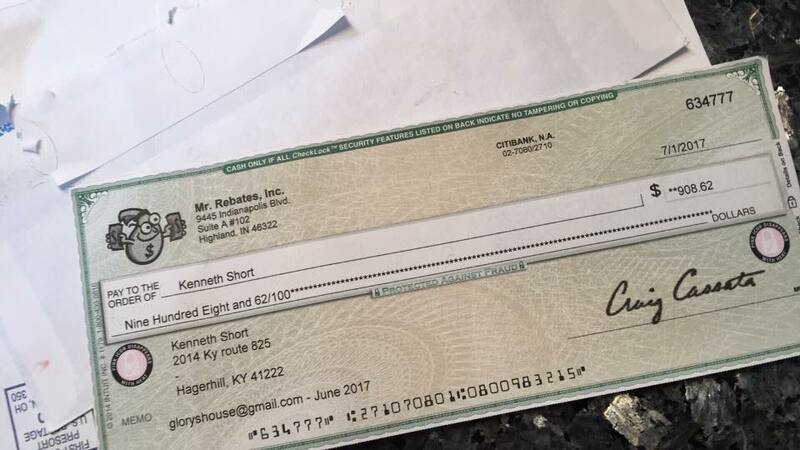 I can go to my account any time to request a check be sent to me from Mr. Rebates. The checks are sent out at the beginning of every month so it is best to wait until the end of the month to request a check. Every person that you get to sign up under you on Mr. Rebates will get the same cash back rewards and you will get an additional 20% of what they earn added into your account. It is a win win situation. I just got a check today and I was so excited I wanted to share because who can't use extra cash. Learning to let our money make us money is just plain wisdom. So sign up for Mr. Rebates today. It will help you, me and all your friends who sign up. Click on the banner above and that should take you through to my account. If you sign someone up be sure to use your personal link to earn your rewards. I always keep a credit card that offers cash back also so I sometimes get up to 8 percent back on my online purchases. My credit cards work the same way. When I want a check all I have to do is call them and request one. I suggest Capital Spark or a card with no Annual fee with at least 1.5% back. This is a very good way to save up for a vacation or for holiday shopping. There is no need for us to be in lack with so many opportunities at our fingertips. Sign up today and start stacking your Mr. Rebates Chips! I am going to buy a new recliner with this so I can set back in it and make more money online. I have learned I can save more money by shopping online because now Walmart offers 2 day free shipping on many products. No more dragging so many groceries home from the grocery store. I have been learning to shop from home and save more by simply using my Mr. Rebates. Thinking about sending for my next check. Thanks to all of you who have signed up under me using my email. It has got my commission up a lot. My next check is up to 1500.00. I am being patient to let the chips stack up. Sign up today and save! Another way to save! If you have a small business you can start sending out newsletters for FREE. After 25 emails pay as little as 4.50 per month for 500 emails or 9.00 per month for 2500 emails. You can recoup that in one sale! Give it a try and get started. They have Free templates and everything you need. Click the box above to sign up for your email list. Later you can upgrade if you need more and pay a fee but I have researched most companies and this company is the cheapest I have found. It is also easy to use. I am using this company and I recommend it. I know I have a lot of customers with a small business. If you do not have a business you can still use it to email people about any information.